Brahms spent a number of years working as a conductor of choral societies and such music forms an important part of his output. Many of his choral works deal with fate and mortality, as can be seen from at least four of the pieces on this disc. The six together comprise pairs of works from three periods of the composer’s life. Brahms’ Begräbnislied (Burial or Funeral Song) is scored for five-part chorus and winds with timpani, enabling it to be performed at a grave-side. The music is appropriately hushed and granitic - like much of Brahms - but with a dramatic aspect that the conductor Antoni Wit brings out with great skill. In the same year of 1858 Brahms wrote the contrasting Ave Maria for a small-scale women’s choral society that he had founded. This piece is simple and lilting, slightly Schumannesque, and also evidences the composer’s study of early music at this time. The Alto Rhapsody is justly famous and has been frequently recorded. Wit’s conception of the piece is a full-blown Romantic one, with great attention paid to the dramatic arc of the work balanced with the severity of Goethe’s text. The orchestra and chorus match Wit in both these regards, though sadly the contralto Ewa Wolak is stolid and evinces little intensity. Brahms was working on the Schicksalslied (Song of Destiny) at the same time as the Alto Rhapsody. This work contrasts the life of the blessed spirits above with the tormented existence of those on earth. As if not wanting to leave the listener with this vision of earthly life, Brahms ends the work with a return to the music of the spirits above. Wit and his musicians turn in a fine performance although it is somewhat lacking in dramatic contrast. Nanie was written in memory of the painter Anselm Feuerbach. In its gentle melancholy it is perhaps the most perfectly balanced of Brahms’ choral works. These elements are lovingly brought out by Wit and his performers. The Gesang der Parzen (Song of the Fates), to a text from Goethe’s Iphigenie auf Tauris, was the composer’s last major choral work. It foreshadows some of the later works such as Op. 110 and Op. 121 in their concern with old age and approaching death. As in the Schicksalslied the happy life of those above - in this case the Greek Gods - is compared to the brevity and misery of those on earth. The Gesang does not end with a consolatory section as does the earlier work. Instead the human voices weaken and finally die away. Wit’s conception of the piece is well-thought out. On the other hand the chorus is quite shrill and the orchestra somewhat lets him down by playing without the requisite pathos. Although best-known for his recordings of Polish works and of the Mahler symphonies, Antoni Wit is also a natural Brahms conductor. He shows great sensitivity to the unique combination of structure and emotional content found in the composer’s works. The Warsaw Philharmonic also has a natural feel for this music, although not always playing to Wit’s standard. The chorus is mostly proficient. The Warsaw Philharmonic Hall has a sound that would severely hurt music of a less weighty cast, but that actually seems appropriate for these works, although the higher instruments frequently suffer. 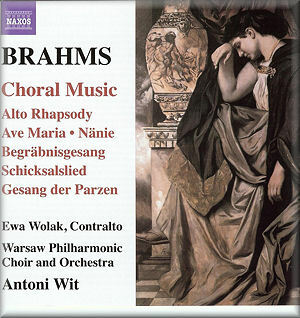 While all of these works have been recorded a number of times, this disc is recommended as an economical compilation of the major Brahms choral/orchestral works (sans German Requiem) in fine performances overall.